For the past couple of weeks, my kids had to take extra lessons to prepare themselves for their national swimming tests. Both were not fast learners...base on the fact that they have been taking weekly swimming lessons for the past 3 years, I am sure other children wouldn't take that long. My younger child, who is rather tiny compared to his peers, took a long while before he could swim 50 metres without stopping. During the earlier days, he was always seen hanging to the side of the pool, very much like spiderman ;) When he took the Bronze swimming test last year, after finishing 4 laps, he could barely walk when he got out of the pool! For this Silver award test he took, he had to swim 16x50m and complete one lap (with t-shirt and a set of pajamas on top of his swim suit) within 4 minutes; while his brother had to swim 20x50m within 45mins and complete 100m under 3 minutes. Both of them lamented that they needed extra energy to take the test; and both came to a consensus that they would get the extra boost from bananas and chocolates. I had wanted to make them some chocolate banana muffins for breakfast, but thought it would be easier just to give them banana and chocolate as dessert. So I made them this age-old treat...baked bananas with chocolates. The bananas I bought were still a little green, but I was not too bothered by it as I knew after baking, the bananas would turn soft and sweet. I cannot remember where or from whom I learned these, but I was quite sure the first time I made them were during my secondary school days. I am now passing on this simple recipe with anyone who is interested to give this a go. - with the skin still in tact, and the two ends pointing upwards, make a slit lengthwise, slicing through the banana but not through the bottom of the peel. - stuff the middle with chocolate squares or chocolate chips. - wrap them with foil and pop in 200degC oven for 10 - 15mins until the bananas turn soft and the chocolate has melted. - remove peel and serve immediately. This sweet treat is best eaten while the banana is still piping hot. 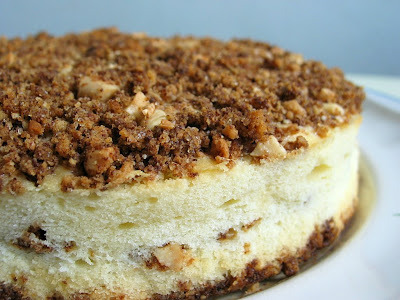 It is great as a after-dinner dessert yet we wouldn't mind having it as a late afternoon snack. Perhaps it also served the purpose of providing the very much needed energy...my kids passed their tests. I don't know whether this dessert had anything to do with it...the younger fellow managed to swim 4 laps of free style and was still among the first few to get out of the pool, on top of that he broke his own record of swimming 100 metres in 3mins 18 seconds. I hope you enjoyed reading this post as much as I have written it! I love the picture your son drew with his calligraphy brush! It's beautiful and you should have that framed up and take it out on his wedding day in future. He'll laugh about it!!! And love the idea too. It's quite an Aussie thingy, I've seen so many people do it here. In fact, raw bananas are just nice as they will not mush and holds its shape even after baking! Tempting shots!!!! My son and daughter swim for 12 years, when they had competitions they even had pasta for breakfast, they love it and at the end of the competition i gave them milk chocolate that i always took in thermos, cold in the summer and hot in winter, i always baked a big batch of brownies,or chocolate filled bread that they share with their team. Now my Son is in the University and I miss those days, I never though I will, I need to drove 30 min to get to the pool and spend there 3 hours every day, then drove back home. Congratulations to your sons and Enjoy!!!! You are such a creative mummy! I never think of stuffing the chocolate in a banana. I will like the combo. Happy day! These photos brought back memories! We use to make something similar as girl scouts. We would also put marshmallows in the bananas, wrap them in aluminum foil and put them in the campfire. They would produce chocolate, gooey deliciousness. Congratulations to your sons. Mother always know whatis best for their children. Keep it up. LOL! I'd never thought of that way of eating bananas! Brilliant! A simplified version of banana split, eh? Congrats to both your boy-boy! So happy for them! And both you and your hubby must be proud parents! 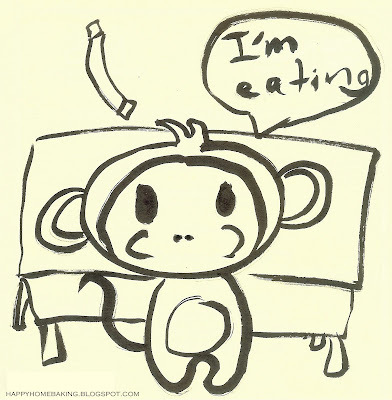 Love the Chinese-inspired sketch of monkey eating, too! Hahaha! I like the doodle by your boy, it is so expressive. I am surprised by the combo, but I guess its cos I am just ignorant. Good way to use not so ripe bananas ... and I love that drawing very much. The black and white picture is very contemporary. Wooo...interesting! Will give it a try soon since my daughter is a big fan of bananas and chocolate..:) Thanks for sharing! HHB, I love your little story about your boys. I smiled when I read about your boys reaching the conensus that they needed bananas and chocolates to boost their energy... how wily...LOL... This treat is a first for me and I can imagine how this can be a hit with kids. Hey HHB :) That looks like such a treat- your lucky boys! And your younger boy's really artistically gifted! Its amazing how simple it can be to come up with a quality, brand new dessert! Prepared this yesterday during a get together and got more than two thumbs up...not bad for a first timer huh... Thanks for sharing this and keep it coming! Felicitari pentru minunatul tau blog! I'm curious to find out, how to add in current visitors in your blog ? Is it under gargets ? I'm in the midst of creating a blog. Sorry I'm not so good at computer. That's why I need more information. then follow the steps and create your own Live Activity (Current visitor) widget. You will be given a set of codes, copy the codes and paste it at Blogger, under the 'add a gadget' section. Thanks! This is really a cool idea. I am going to give it a try with my grand children. Hi I wan to know how to prevent chocolate from melting so fast. I wan the choclate that I make to last long like those bought from outside. However the chocolate I make dosent last long as it will slowly melt. So I woukd like to know if you could help me solve the problem thks.